As expected, the Undead Nightmare DLC pack for Red Dead Redemption will be out just in time for Halloween. People across the territory of New Austin are rising from their graves and its up to John Marston to put them back down. For those of you without an internet connection, Rockstar announced that it will package all of its DLC to date including Outlaws to the End, Legends and Killers, Liars and Cheats and all its multiplayer Free Roam downloads on a disc with Undead Nghtmare. The package will cost $29.99 and will not need the original game to play, like Episodes from Liberty City. We don't know when the separate SKU will drop but meanwhile, you can download Undead Nightmare, which does require Red Dead Redemption to run, on Oct. 26th on Xbox Live and PSN for 800 MS points or $9.99. "Undead Nightmare turns the world of Red Dead Redemption upside down," said Sam Houser from Rockstar Games. "The supernatural vibe and the return of some favorite characters create a whole new game inside an already incredible world." 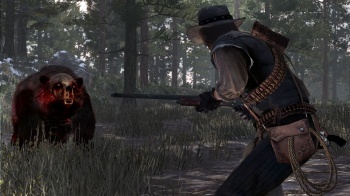 The first singleplayer-centric DLC for Rockstar San Diego's hit Western game, Undead Nightmare will add around 5 hours of missions, strangers to help and town survival mechanics. Many of the voice actors from the original return for new cutscenes and John Marston's arsenal now includes a blunderbuss that can shoot zombie parts. The storyline of Undead Nightmare is a side-story from the main narrative, so you will be able to play it no matter what point you are in the game. Also, it needs to be said, with "nightmare" in the title it's possible that the whole DLC will be just a dream. It's a little lame, but that seems like the only way to keep the continuity intact. Marston will use his blunderbuss, all his other guns, plus a handy-dandy torch to take out four different zombie classes, including an acid spraying beastie and a huge portly woman turned ravenous undead monster. More beasts other than undead cougars and bears exist on the frontier. You can break and ride undead horses just like in the original with an interesting twist: if you whistle for your horse after it has been killed, it will come back to you as the living dead. I don't know about you, but I'd be reluctant to dig my spurs into that. There will also be multiplayer modes, including Undead Overrun where you and your fellow gunslingers fight off wave after increasing wave of rampaging undead. I don't know about you guys, but I'm not a big purchaser of DLC. Usually, I get enough out of a game without needing to spend more money on it. But there's something about Undead Nightmare that just tickles my fancy. I will throw down my 800 points on Oct. 26. If you haven't seen the trailer, here it is for your viewing pleasure. Just watch out for undead bears.